Stuck in traffic on July 4th weekend somewhere north of San Francisco, I remarked to my travel companion how the rolling hills — the same that are sometimes rendered on the front covers of Steinbeck’s Grapes of Wrath — looked dry, indeed crispy, as if they could set fire at any minute. Later this summer, new municipal restrictions on the number of times per week residents of the East Bay can water their gardens supposedly went into effect, and everyone was arguing about almonds and beef on the internet. My tomato plants were still producing fruit in the dog days of late September, their flesh splitting in the sun. Many agricultural operations in the Central Valley have folded. Many jobs have been lost. All of the shelters from here to Sacramento are full. It doesn’t feel to me like a crisis all the time, but. When I first caught wind of the apocalyptic proclamation that the state’s water supply was going to run out within the year, I wrote it off as alarmist clickbait. We’re definitely in trouble, just not in this (my) lifetime. I’m just not that kind of environmentalist, I can’t be — paranoid ranting offends my cultural sensibilities. This was the summer that the Valley Fire burned through Lake County in Northern California and destroyed more than 1,200 homes, making it the third most destructive wildfire in California history. The local news zoomed in on Harbin Hot Springs, a popular spot to soak in sacred waters and connect with the earth and/or other cosmic energies. The footage from after the fire is surreal: a gathering place for those who use phrases like “gathering place” in their daily lives covered in soot, toothpick tree trunks spearing a dense sky overlooking grounds that used to feel like an out-of-time paradise. Governor Jerry Brown says the Valley Fire happened because of climate change etc., and the people are happy that an important politician is connecting the dots. “This is the future,” he says. And then a lake up north disappeared, drained like a bathtub, leaving thousands of fish dead on ground that won’t stay wet for long, not in this heat. Local fishermen are very upset — the fish could’ve been relocated! Pacific Gas and Electric, which owns the rights to the water, has yet to provide an explanation. It must smell horrible there. I am almost 26 and precariously employed and not from here. Thinking about this stuff in earnest adds a layer of complication that I don’t feel quite ready for. Ready or not, Gold Fame Citrus landed in my lap, and asked me to more seriously consider what future world these mini-apocalypses might be leading us towards, providing harrowing visions of the California dream rotting in the scorching sun. As terrifying as it is entertaining, it speaks to the part of me that sees a drained lake as more than a localized crisis affecting only a handful of fish, and wonders about the texture and shape of the greater crisis that an event like this portends. 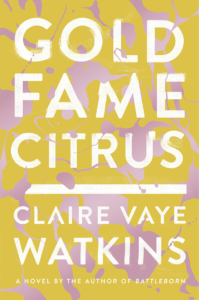 Claire Vaye Watkins situates California’s familiar tropes, mythologies, characters, and subcultures in a bleak dystopian setting, luxurious in detail and bold in scope, a California that’s been given up on and let loose. Long drained of water, its people are incidentally surviving in the chaos that’s mounted in its absence. In the years between our present and when the events of Gold Fame Citrus take place, the country has endured a civil war that must have been accelerated if not caused by a great paucity of natural resources (principally water). There are still militiamen guarding the border with Oregon, and Californians have been relegated to second class citizenship, referred to as ‘Mojavs’ and treated the way America treats all the refugees that it creates, which is to say poorly. Baby Dunn, born with a golden shovel in her hand, adopted and co-opted by conservation and its enemies, her milestones announced in press releases, her life literal and symbolic the stuff of headlines, her baby book lousy with newspaper clippings: GOVERNOR SIGNS HSB 4579; EVERY SWIMMING POOL IN CALIFORNIA TO BE DRAINED BEFORE BABY DUNN IS OLD ENOUGH TO TAKE SWIMMING LESSONS. BABY DUNN STARTS KINDERGARTEN TODAY WITHOUT GREEN FIELDS TO PLAY IN. LAST CENTRAL VALLEY FARM SUCCUMBS TO SALT: BABY DUNN, 18, NEVER AGAIN TO TASTE CALIFORNIA PRODUCE. BERKELEY HYDROLOGISTS: WITHOUT EVACS BABY DUNN WILL DIE OF THIRST BY 24. Baby Dunn would grow up in and then eventually out of the public eye into Luz, the protagonist of Gold Fame Citrus. When we meet her, she’s squatting with her boyfriend, Ray, in a formerly desirable area in LA in a tasteful modernist estate that used to be occupied by a starlet with a great wardrobe, a lackluster modeling/acting career already behind her. Luz’s compatriots, those LA’s dominant industries left behind and others who didn’t make it on the crowded eastbound buses, drift in and out of the palatial abodes of those who had a place to go when the drought and the heat chased them out. LA has become a ruinous, desertified hellscape populated by mostly crooked and inert zombie-like humans who are half-heartedly piecing together their own survival and not much else. Luz and Ray have recently extricated themselves from a community of cynical looters who sit in their Santa Monica garden apartment talking about the drought as a purifying force, cleansing the city of the owning and exploiting classes and anyone else who can’t hack the conditions. In their eyes, the only way to conquer destruction, or merely not to let it conquer you, is to get in bed with it, encouraging it along. This cast of Californians is caught in a nightmare of drought and ruin, trapped between the Pacific Ocean and a sea of sand and salt. Luz and Ray head down from Laurel Canyon with “ration cola” and some sort of salty moonshine to Venice Beach for a rain dance, a crusty, druggy network of drum circles and fires. A black market has taken shape in the canals, as sellers hustle such delicacies as “hard sour strawberries and blackberries filled with dust. Flaccid carrots, ashen spinach, cracked olives, bruised hundred-dollar mangos, all-pith oranges, shriveled lemons, boozy tangerines, raspberries with gassed aphids curled in their hearts, an avocado whose crumbling taupe innards once made you weep.” After buying a can of slimy blueberries that ends up costing them over $100, Luz and Ray reemerge from canals and come face to face with a toddler, a rare sight in this undernourished LA. When they see the neglectful, possibly abusive junkies that she wanders back to they decide, drunkenly, to bring her back with them. After the rescue/kidnap of the child who comes to be known as Ig, everything changes. Formerly a couple, Luz and Ray are now part of a family. They quickly internalize the weight of their new responsibilities as they come to grips with the reality that small children can’t survive on their own, and they also can’t survive the way Luz and Ray have been surviving. There is no longer time to try on ostentatious getups from the starlet’s wardrobe or reread biographies of John Muir and Sacagawea. They are no longer living their lives just to pass the days — there are coffee table corners to baby-proof, diapers to improvise out of the starlet’s supply of Hermes scarves and maxi pads. Here was one worry: Ig. She was worry pooping into an Hermes scarf, worry with skittering coin eyes, worry moaning in the daytime, worry panting at the heat, worry howling through the night. Worry strung out on ration cola, worry with its bulbed head on Luz’s lap. Worry drowsy but fighting it, always fighting it, worry worrying the gauze blooming from her mouth. Worry gathering all other worries to them. But Ig was too delicate to resent, too pearly-skinned to solve, and right now, stroking the tip of her nose with the tip of the nine, vastly too gentle, so much like a godsend. It’s clear, very early on, that they need a way out. The scope of Luz and Ray’s dreaming is widened by the strange small human under their care, and when they think alternatives to their life in LA, they think dewy forests in the Pacific Northwest or middle American domestic bliss in some place like Wisconsin. They’ve got a car, and they call on their estranged friends to help them pull together the resources they need — food, water, gas, and a vague sense of direction. People don’t just cross the Amargosa, the massive “dune sea” spanning thousands of miles that erased most of California, named for the first (and not the last) mountain range it interred. Navigation is nearly impossible as “Partial maps of one face or another are etched almost immediately to obsolescence by the ever-shifting sands.” Nevertheless, Luz, Ray, and Ig set out on their journey eastward, away from California. They weaved through the sacked backyards of the abandoned craftsmen, past their shredded Burmese hammocks, drained koi ponds, groves of decorative bamboo gone to husks. Upended kilns, mosaics of pottery shards, slashed screens, slivers of smashed Turkish lamps lynched from what had once been a lemon tree, hummingbird feeders still half-filled with pink nectar, wire skeletons of dissolved paper lanterns, a splintering croquet mallet, terra-cotta pavers, disintegrating block walls, gutted cushions, a burnt-out miniature pagoda, a canoe filled with excrement and ancient newspaper. It’s within these lists that the setting starts to feel believable as a mutation of the California we know and (try to) love, as quick glimpses of a recognizable world are tweaked, the author builds a bridge for the reader to be able to visualize a waterless world to come. We recognize the characters that populate this parched landscape — the wonky, druggy, dangerously charismatic cult leader, the former actress/model with frown lines and dead eyes at age 25, the surfer escapee of Midwestern origins who only stopped running away when he got to the edge of the continent, the hippie matron who begrudgingly endures the limiting and regressive gender dynamics of back-to-the-lander social traditionalism. We’ve seen them before but we’ve never, or perhaps haven’t yet, seen them quite like this. Gold Fame Citrus speculates on how the Californians of our cultural imaginary might react when water is taken out of the equation, as it inevitably will be if things continue as they are. It asks how the rest of the country might look Westward when “America’s Fertile Crescent”, the Central Valley, has turned to salt and all of Hollywood has gone back east. Embedded within Gold Fame Citrus is a critique of the current efforts to halt the effects of global climate change and the overconsumption of natural resources. The scientists who came to fight the good fight (when people were still fighting) were “stalking tenure,” the journalists were byline hungry, governmental agencies were rendered ineffective by bureaucracy. Gold Fame Citrus doesn’t offer any recommendations for ways to fend off environmental catastrophe, or suggest different or better approaches. But in acknowledging some of the ways in which our current approach isn’t working, the novel impels the reader to seriously consider – to fully imagine – the possible consequences of climate change. Prophecy lands differently when it comes in the form of a dazzlingly smart, brave, and nuanced novel, not from the lips of some wonky Facebook uncles, religious zealots, or out of touch academicians. Gold Fame Citrus sidesteps the question of “What are we gonna do?” to examine instead how the conditions of drought and climate change might transform a land and how that might, in turn, transform a people. 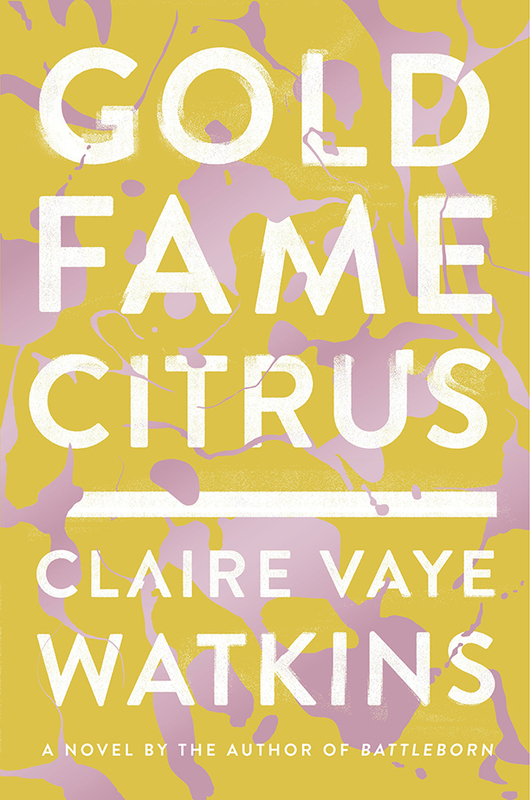 The world is not ending, the world is changing, and it’s works like Gold Fame Citrus that can help us articulate literature’s place in the larger conversation. Hannah Klein is an artist and educator based in Oakland, California. Her website can be found here.